Corboy & Demetrio Co-founder Thomas A. Demetrio was ranked the top lawyer in the state by Illinois Super Lawyers for 2019, the attorney rating service announced today. It’s the third consecutive year he has been named the #1 IL Super Lawyer out of 94,000 lawyers licensed to practice in the state regardless of their practice area. 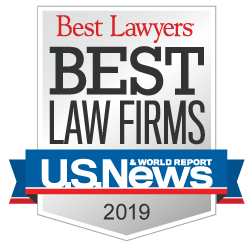 “It is a true honor to receive such recognition from Super Lawyers and from my peers for a third year, especially with all of the exceptional legal talent in our state,” Demetrio said. Tom has acquired well over $1 billion in verdicts and settlements in his career, including the first ever 8-figure compensatory verdict in Illinois and the largest single personal injury verdict ever upheld by the Illinois Supreme Court. All of his verdicts have been paid, and he has never lost an appeal. The National Law Journal and The Trial Lawyer magazine recently named Tom one of the 2018 members of The RoundTable: America’s 50 Most Influential Trial Lawyers. Tom’s selection was based on his significant achievements in the legal profession and places him among the top 50 plaintiff and criminal defense attorneys in the United States. That achievement, too, was his third consecutive year receiving it. Tom has been included in every edition of Best Lawyers in America since 1987. The National Law Journal, in 1990, named Tom one of the top 10 litigators in America and in 2014, the Journal named him as one of its inaugural 50 “Litigation Trailblazers and Pioneers,” the only Illinois plaintiff’s trial lawyer receiving that distinction. Since 2007, Tom has been voted by his peers to be in the top five of all lawyers in the state by Illinois Leading Lawyers. In 2016, the Illinois Trial Lawyers Association bestowed on Tom its highest honor, the Leonard M. Ring Lifetime Achievement Award. Also, in 2016, Tom received the Chicago Bar Association’s prestigious United States Supreme Court Justice John Paul Stevens Award – from Justice Stevens himself.